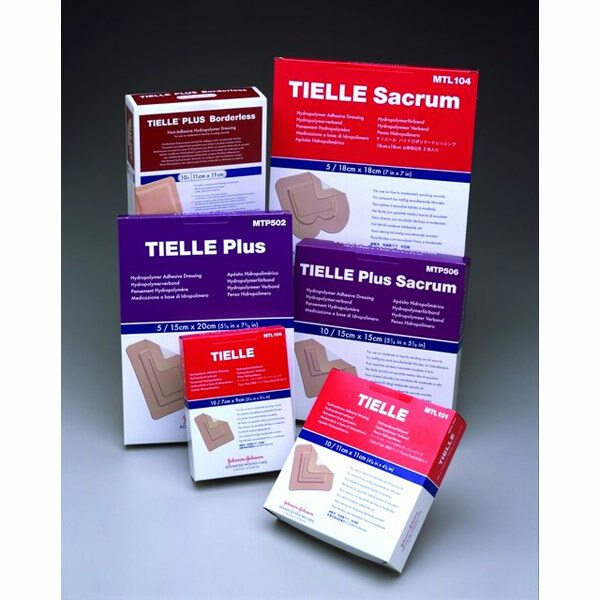 TIELLE PLUS Hydropolymer Dressing Most absorbent adhesive dressing available from Johnson & Johnson. New super-absorbent, nonwoven, wicking layer allocates excess moisture away from wound site. Eliminates need for tapes. Use for moderate to heavily exudating wounds. Water-resistant and water vapor permeable. Sterile Overall 4 1/4" x 4 1/4" Pad area 2 7/8" x 2 7/8"